This pretty young girl is Ava. 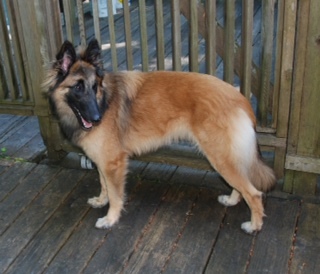 Ava is a 2 year old Belgium Tervuren who presented to a local reproduction specialist for a pregnancy check after breeding. The ultrasound showed that Ava was not pregnant but did have a large mass or cyst in the area of her right ovary. A type of ovarian follicular cyst was suspected and since the owners wanted to breed Ava, a laparascopic procedure was scheduled to remove the ovary on the affected side so that Ava could still be bred. A 5cm mass was removed along with the right ovary and a biopsy revealed it to be a papillary cyst adenoma or benign cyst of the ovary. Ava healed up quickly and will hopefully soon be bred. Congratulations Ava on being this month’s Pet of the Month.